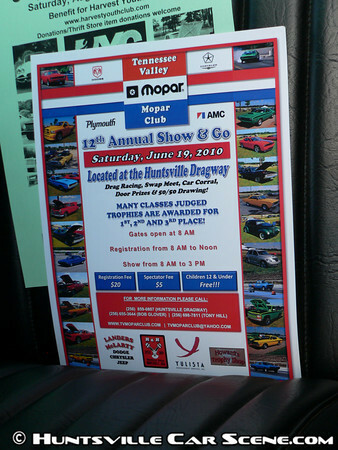 "Drag Racing, Swap Meet, Car Corral, Door Prizes and a 50/50 Drawing. Any Chrysler Corp. or American Motors Corp. vehicle of any body type that is 1975 or older and in original, non-restored, condition. Acceptable replacements from the original equipment are such things as brake master cylinders, belts, hoses, tires, battery, and any other rubber type items subject to deterioration from time alone. These vehicles cannot have been repainted or fully re-upholstered. Replacement panels in seats are acceptable as is spot paint for corrosion control. Drag Racing Class = Street Car - Any Chrysler produced vehicle, whether modified or not. Registration is $20, spectators $5, children 12 and under free." This is the largest Mopar show in the area, and one of the largest events of the year, period. It's also one of the few events where you can not only see the cars sitting still, but see them do what they were built for. I overheard some guys talking about doing the same thing at Cafe 302 last night. I think this is one of the coolest events we have locally since you can see cars static as well as moving.